Founded in 1919 in Richmond, Virginia, Altria (MO) is America’s largest tobacco company. The business split into three separate firms in 2007 and 2008 (Altria, Phillip Morris International, and Kraft), with Altria retaining all domestic tobacco operations. Altria has exclusive U.S. rights to sell cigarettes primarily under the Marlboro, Parliament, Virginia Slims, and Benson & Hedges brands. The company also markets cigars (Black & Mild), chewing tobacco (Copenhagen and Skoal, Red Seal, and Husky brands), and table wines under the Chateau Ste. Michelle, Columbia Crest, and 14 Hands brands. In recent years, Altria has invested heavily into non-combustible reduced-risk products to adapt its long-term business model for an eventually smoke-free world. One area of focus is the IQOS nicotine delivery system (not yet FDA approved), which heats tobacco instead of burning it, thus releasing far less toxic and carcinogenic chemicals. As part of its new strategy, Altria has said it will shut down its own e-cigarette and vaping businesses to focus exclusively on helping Juul grow in the U.S. where it has 75% market share, according to Nielsen. Altria also owns a 10.2% stake (valued at more than $15 billion) in Anheuser-Busch InBev (BUD), the world’s largest beer company. Overall, Altria’s revenues and operating profits remain dominated by its core cigarette business, which accounts for approximately 90% of total sales and operating income, with almost all of the rest coming from its smokeless division. Wine represents just 2% of sales and 1% of operating income. Adjusted for its 2007 and 2008 spin-offs, Altria has increased its dividend for 49 consecutive years. This quote from Warren Buffett about the advantages of the tobacco industry is precisely why Altria has been such a great high-yield dividend growth stock for so long. Speaking of brand loyalty, the company’s Marlboro brand has grown to become the nation’s dominant cigarette brand with 43% market share and generates nearly 90% of the company’s overall smokable volumes. Factoring in all of its brands, Altria's U.S. market share was 49.8% at the end of 2018. The firm's industry-leading brand equity means that it has strong pricing power to offset the 3% to 4% annual volume declines in cigarettes that have been the long-term industry trend. The cigarette industry’s price elasticity has ranged from -0.3 to -0.4 over time, which means that consumption declines by 3-4% for every 10% increase in price, allowing revenue to still grow despite volume decay. On Altria's fourth-quarter 2018 conference call, management reiterated its belief that price elasticity will remain about -0.3 in the long term. Studies show that premium brand smokers are less likely to quit, and Altria's cigarette volumes are about 90% premium (and thus have stronger pricing power) thanks to Marlboro. However, U.S. cigarette volume declines have accelerated in recent years. In 2018 U.S. cigarette volumes slipped 4.5%, their worst performance since at least 2013. Going forward, management believes industry volumes will continue declining 4% to 5% per year through 2023. Rising popularity of vaping, which grew 35% in 2018 according to management, is contributing to the cigarette industry's volume challenges. 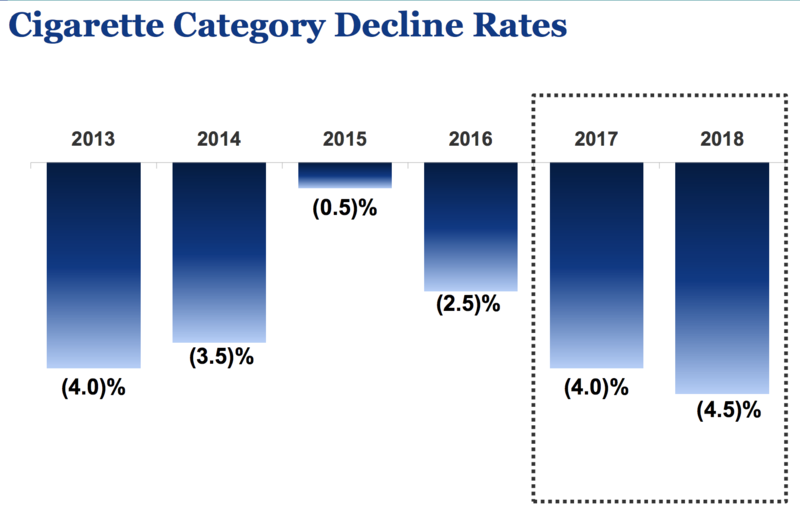 "We previously cited a secular decline rate within a 2% to 3% range. This rate includes smokers who reduced their consumption, those who stopped using tobacco products, and smokers moving to other tobacco categories. In 2018 we estimate that the secular decline rate was elevated due to increased movement by adult smokers across categories which historically accounted for about one percentage point of the 2% to 3% secular rate. This acceleration is largely attributable to e-vapor category growth, especially in light of the decline in the smokeless category in 2018." The key to Altria's ability to deliver growth over time when its core product is always facing shrinking volume is pricing power, made possible by its strong brands and the addictive nature of tobacco products. In fact, over the past year, Altria has increased the average price of a pack of cigarettes by 4% (though this is below its historical 5% to 6% annual price hikes). Consistent price increases have resulted in steadily rising revenue and earnings for the company, whose adjusted operating margins on cigarettes were among the highest in the industry at 50.6% in 2018. While Altria’s business remains driven by cigarettes, the company realizes that the secular decline in smoking represents its biggest long-term growth headwind. This is why in December 2018 management made the strategic (if controversial) $12.8 billion investment in Juul Labs to own a large stake in the most dominant U.S. vaping company. But Juul's ambitions are not limited to the U.S. Management estimates the global reduced-risk product, or RRP (vaping and heat stick), market reached $23 billion by the end of 2018. Juul currently operates in eight countries and has plans for rollouts in other nations. In other words, the business could be a solid way for Altria, which only plays in the U.S. today, to tap into global growth opportunities that don't threaten its core U.S. smoking business (it doesn't sell cigarettes overseas). "Ultimately, we expect the (Juul) international revenue and income opportunity to end up being as large as or larger than the U.S. opportunity. Our 35% investment was based on a deep strategic operational and financial analysis of Juul in the marketplace." 2023 is when Altria expects Juul's international sales to equal its domestic revenue, with operating margins about equal to those on cigarettes. Yet despite the strong growth in vaping that Altria expects to happen, U.S. cigarette volumes are expected to decline by just 4% to 5% annually over that time period. Similarly, cannabis, is a young but fast-growing industry, explaining Altria's investment in Cronos. Once again, management paid a steep price to diversify the company's long-term growth drivers. Altria cited a third-party study which concluded that, depending on legalization, by 2028 global cannabis sales could range from $40 billion to more than $250 billion. For perspective, the U.S. tobacco market is worth $125 billion. Given this market's potential, even large beverage companies such as Coca-Cola are considering investments into this new industry. Management hopes Juul and Cronos can leverage Altria's massive distribution network (dominant shelf space at many retailers), well-known brands (Marlboro), and extensive experience working with regulators to help them establish leading positions in their markets. If Altria's strategic plans work out as expected, then income investors could expect about 8% long-term annual dividend growth from the company. However, several clouds are forming on the horizon. Despite its impressive dividend track record over the decades, Altria faces significant regulatory risks at the local, state, and federal level. 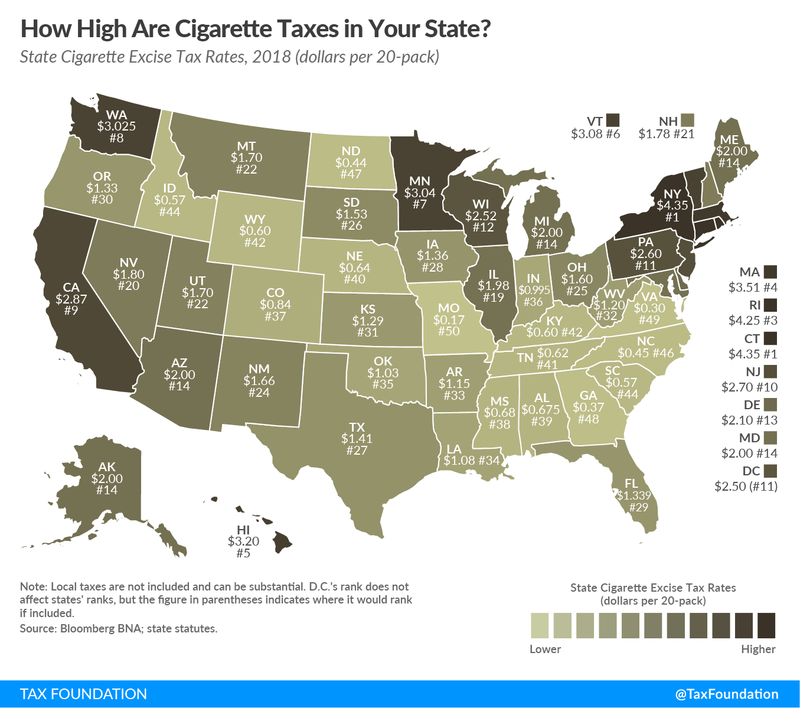 For example, local municipalities and states desperate for revenue are more than happy to continually raise tobacco excise taxes (which now consume more than 25% of cigarette revenues). In 2017, for example, California raised its excise tax by $2.00 which helped accelerate U.S. industry volume declines to 4%. The Federal government imposes a $1 per pack excise tax while states and cities also add on their own sin taxes. For example, in 2017 New York City raised its tobacco tax by $2.50 per pack, bringing the minimum cost of a pack to $13, the highest in the nation. For context, the World Health Organization estimates that the average cigarette price in 2017 was $5.50 in the U.S. and the highest in the world was in Australia ($14.50) after years of the world's most stringent anti-tobacco regulations and tax hikes. In some U.S. cities, Altria's premium cigarettes could eventually cost nearly as much as Australia's, which might limit how long it can keep increasing prices at its historical rate. That might explain why the company's price increases in 2018 were lower than its usual norms (including about 6% in 2017). High taxes are just part of the ongoing war on tobacco. The Federal government has also crusaded against big tobacco, with numerous attempts to regulate the industry in ways that are designed to lower smoking rates. For example, various politicians have called on the FDA to ban menthol cigarettes (the most popular kind), and the FDA has indeed said that it plans to eventually do just that. In early 2018 the FDA also announced a long-term regulatory plan to “lower nicotine levels to non addictive levels." However, the regulatory process is extremely long, so any phased-in nicotine restrictions aren’t likely to hurt Altria over the short term. In the U.S., where the FDA has the ability to regulate (but not ban) cigarettes, there is a nine-step rulemaking process, for example. British American Tobacco (BTI) estimates that the menthol ban (currently at step three) would likely take about nine years to go into effect. A nicotine reduction rule is similarly likely to take about a decade since it's even earlier in the regulatory process (step two). That being said, the decades-long American public health crusade against cigarettes has understandably resulted in a gradual decline in smoking. For example, the U.S. smoking rate for adults declined from 42% in 1955 to just 14% in 2018 (and is projected to hit 12% in 2020). And with high-school smoking rates now at 9% (thanks largely to the popularity of vaping), it's likely that smoking rates will decline to the single digits eventually. With U.S. cigarette volumes expected to decline around 4% to 5% per year going forward, Altria investors are counting on three things, in particular, to keep the company's earnings and dividend growth alive. First, the company will need to keep raising prices to offset its falling volumes. While Altria has a great track record here, thanks to its brand loyalty, there are potential limits to how high the firm can raise its prices. From higher excise taxes to the continued rise of vaping and the FDA's scrutiny of nicotine levels, industry dynamics could change going forward. Only time will tell, but investors need to keep a close watch on industry volumes. Outside of combustible cigarettes, Altria's large investment in Juul comes with risks as well. The firm paid a steep valuation multiple of nearly 40 times sales, banking on Juul achieving rapid growth in the years ahead. While Altria's plan to speed up Juul's growth through its 230,000 retail locations in the U.S. might work, Juul might also suffer from the FDA's latest threat against the e-cigarette industry. The FDA is incensed that the 2018 National Youth Tobacco Survey showed a 78% increase in vaping among US high-schoolers and a 48% increase among middle schoolers. The FDA has accused e-cigarette makers, most notably Juul, of benefitting from flavored products sold to underage customers at convenience stores and has the legal authority to regulate vaping products as well. Should youth usage continue rising in 2019, it's possible e-cigarettes are taken off shelves as their manufacturers are forced to work through the FDA's regulatory approval process. Your guess is as good as mine regarding how long this could take, how it could shake up JUUL's current dominance of the e-cigarette market, and how much it could ultimately cost. While Altria's deep pockets and legal expertise would give Juul an edge if it had to go through such a process, it would almost certainly slow the company's growth rate and potentially result in a write-down on Altria's big investment. Altria's investments in Juul and Cronos have also reduced some of the firm's financial flexibility going forward since they required it to take on over $14 billion in debt. S&P and Fitch responded by cutting the company's credit rating two notches to BBB (Moody's has the company on negative outlook ahead of a potential cut), and management estimate that Altria will face about $600 million per year in additional interest expenses. To help offset this expense, Altria plans to shut down its U.S. vaping business as part of a 2019 cost-cutting initiative that's expected to reduce expenses by $575 million by the end of the year. So those savings, if achieved, will basically cover the higher interest costs. In addition, management has vowed that the firm will maintain no lower than a BBB credit rating going forward, with debt reduction a key priority. Fortunately, Altria was in great financial shape prior to making these two large investments. While it's hard to say when, if ever, these deals will begin generating meaningful cash flow for the company, they do not appear to endanger Altria's dividend at this time. However, Altria's ability to deliver on its 7% to 9% long-term annual EPS and dividend growth target is not guaranteed. Guidance is just a plan, not a promise. The company's ability to deliver will depend on numerous factors outside of its control, in addition to solid execution on its cost-cutting strategies and long-term growth initiatives outside its core cigarette business. While Altria has a great track record of meeting long-term guidance, it's possible that a wave of ever-stricter anti-tobacco regulations could ultimately cause its core strategy (ever higher cigarette prices offsetting falling volumes) to result in lower earnings and dividend growth than investors are used to or currently expect. Tobacco stocks aren’t for everyone, especially if you have moral misgivings about investing in an industry whose products ultimately harm its customers. However, if you are comfortable with the business model, as well as the numerous regulatory and growth risks associated with it, Altria appears to represent one of the fundamentally best choices in the industry. That’s largely due to the company’s possession of some of the strongest tobacco brands in America. Combined with an impressive ability to cut costs, raise prices, and grow its earnings and free cash flow over time, Altria could be a decent choice for dividend investors who are looking for high-yield stocks and don't mind the company's risk profile. It's certainly true that investors need to watch the company's execution closely in the coming years to ensure Altria can deliver on its cost-cutting promises, which are essential to servicing its much larger interest costs. 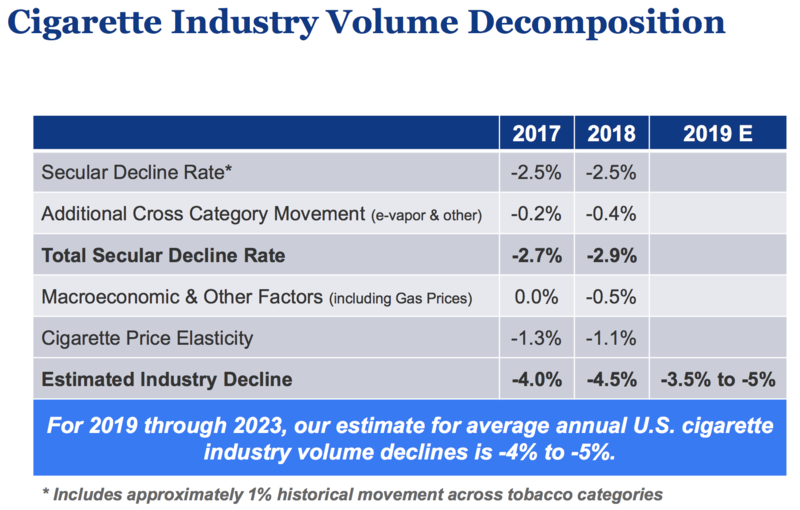 In addition, cigarette volume declines are going to be another key metric to monitor, since an acceleration to 5% or 6% annual declines could counter the company's historically strong pricing power. If volume declines accelerate above 5%, then Altria's earnings and dividend growth rate is likely to fall below the 7% low end of management's current long-term guidance. We will continue monitoring the latest regulatory developments and trends in Altria's core tobacco business, providing updates as necessary. In these more complex situations, the importance of maintaining a well-diversified dividend portfolio to reduce company-specific risk can't be overstated.